CarGurus has 126 nationwide 4C listings starting at $42,900. When the Alfa Romeo 4C launched last year, it marked the end of Alfa Romeo's 20-year absence from the U.S.—and the brand came back in style. Now back for its second year, the 4C looks set to continue taking America by storm. When looking at the 4C, it's hard not to imagine taking it out on the track and putting it through its paces. Powering this little Italian stallion is a 1.75-liter turbocharged 4-cylinder pumping 237 hp to the rear wheels. That'll get you from 0 to 60 mph in 4.1 seconds, while delivering fuel economy of 24 mpg city/34 highway/28 combined. Sports car purists will be sad to hear the 4C is again available only with a 6-speed automatic transmission—but at least it's a dual-clutch, so it feels a bit like rowing your own. The inside is both the 4C's biggest strength and its biggest weakness. Getting in is the hard part. Thanks to the car's low profile (it stands proud at 3'11"), it can be quite tricky to lower yourself into the driver's seat, but once you're in, you won't want to get out—which is good, because you probably won't be able to. You'll find there's room inside for you and a friend, but not much else (don't expect to fit much in the trunk either—the 4C offers a whopping 3.7 cubic feet of trunk space). That doesn't matter, though, because as soon as you fire up the engine, you're not going to want to be anywhere else. The 4C will be available in 2 trims this year: Coupe and Spider. For many sports car enthusiasts, the original coupe version of a car is the better choice, as convertibles tend to lose rigidity and gain weight, making them less capable on the road. This is not the case with the 4C, however. 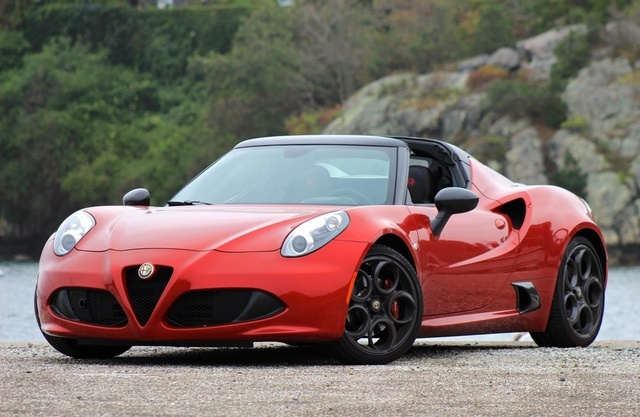 Thanks to some brilliant engineering from Alfa, the 4C Spider is just as rigid as the Coupe, and since much of its structure is made of carbon fiber and aluminum, the Spider weighs a mere 22 pounds more. But all that engineering doesn't come cheap: opt for the Coupe and you'll shell out $55,900 for your new Italian toy; pick the roadster and that figure climbs to $65,900. Hop in the Coupe and you'll find a pretty basic interior—you're paying for the performance, not the luxury. That's nothing that can't be upgraded, though; while the Coupe comes with standard cloth seats, 4 different types of leather are available for various fees. Also available are 3 different sets of upgraded wheels, a host of brake calipers, a sport-tuned dual exhaust, satin mirrors, and bi-xenon headlights. If you want a more comfortable car, you can choose the Convenience Package, which adds cruise control, a security alarm, and rear parking sensors. Those who want an even sportier ride can add the Coupe Track Package (high-performance suspension, carbon fiber mirrors, and a carbon fiber rear spoiler), an upgraded Coupe Track Package (a racing steering wheel), or Carbon Fiber Interior Trim. Go for the Spider and you'll not only get a removable top, but a more luxurious interior as well. With leather seating standard and microfiber racing seats available for a fee, the 4C Spider feels a bit more like an exclusive European sports car than its Coupe sibling. It also has more options. Pick the Spider and you'll get all the same options as the Coupe, plus an available carbon fiber halo. You can also upgrade to any one of five different sets of wheels. That not enough? You can even opt for the same four packages found on the Coupe, though in slightly modified form (the carbon fiber rear spoiler is not available in Spider packages). The Alfa Romeo 4C may not be the most comfortable or luxurious sports car out there, but that's what makes it so great. You see, the 4C is exactly what it portrays itself to be—a sports car, pure and simple. There are no distractions inside the cabin, no massaging seats to take your head out of the driving experience or gadgets to take your eyes off the road. If you're looking for a pure sports car that will capture your imagination and leave you wanting more every time you have to walk away from it to do something else, the 4C should be on your list. What's your take on the 2016 Alfa Romeo 4C? Have you driven a 2016 Alfa Romeo 4C?